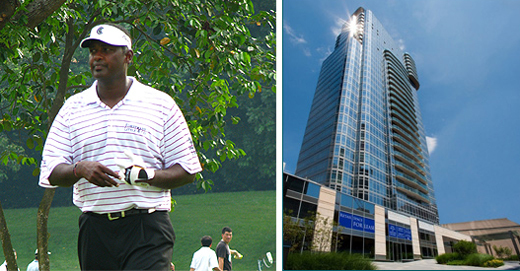 Professional golfer Vijay Singh and his wife Ardena Seth have purchased a $5.675 million penthouse condominium at 555 West 59th Street in Lincoln Square. The 3,369-square-foot duplex unit in the newly constructed Element near West End Avenue has four bedrooms and a wood-burning stove and was listed in June at $6.9 million by Brown Harris Stevens, according to Streeteasy.com. The 46-year-old golfer signed a contract for the unit July 1 and then closed on the sale July 23, according to city property records posted today. The 34th- and 35th-floor apartment has views to the north, east and south and includes a 1,463-square-foot terrace, the listing said.